Greg Norman Company, Verizon and Club Car have collaborated to bring you Shark Experience – a revolutionary way to enhance your golf game. (WEST PALM BEACH, FLA.) – GN Media – an affiliate of Greg Norman Company (GN) – today announced plans to exhibit at the 65th PGA Merchandise Show, Jan. 24-26, 2018, in Orlando, Fla.
From Wednesday, Jan. 24 to Friday, Jan. 26, Shark Experience will exhibit on the show floor at the Club Car booth #2928 where attendees can interact with the new technology. Developed by an unprecedented partnership of industry leaders across golf and technology, Greg Norman Company, Verizon and Club Car have collaborated to bring you Shark Experience – a revolutionary way to enhance your golf game by bringing connectivity, content and customization to the golf course. 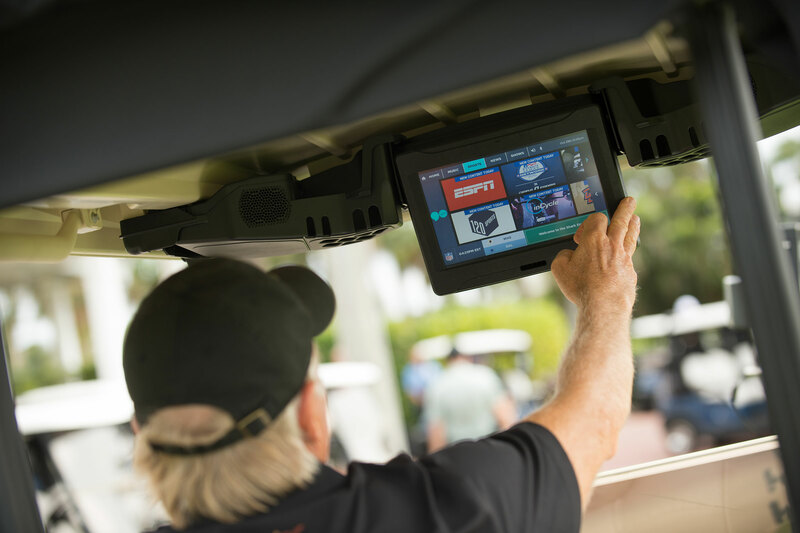 Leveraging 4G LTE wireless technology, a high-definition touchscreen display and built-in speakers – all exclusive to Club Car golf cars – golfers enjoy streaming music via Slacker Radio, Bluetooth connectivity, live sports and highlights, news, entertainment, Greg Norman golf tips, dynamic yardage information, hole flyovers and more. Along with Shark Experience comes the introduction of a seamless, cashless experience from Clubhouse to course.